This weekend I unsoldered all the key switches on two keyboards. One is my Tactile Pro and the other is one of several old SGI Slabs I have stashed. The tactile pro has advantages like a modern layout that matches my Macs and USB rather than PS/2 but the reproduction switches never felt the same as the original alps switches. After I’d soldered all the old switches onto the Tactile Pro I took advantage of having two sets of key caps to choose from, one of them 2 tone, to fit it with 3 tone key caps. It now feels much the same as the SGI keyboard I use on my work machine but with the extra keys. 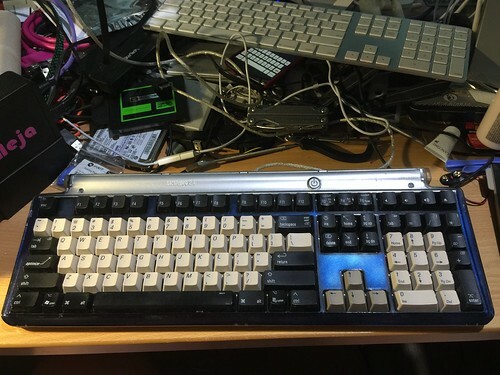 My work machine runs linux which needs the extra keys less: Macs have had command and option since there have been Macs and linux/unix tend to be the least fussy OS when it comes to keyboard layout.